Detailed information on the construction of the RMS Titanic. The facts about how it was built in Belfast, Ireland by Harland & Wolff. Excellent content or teachers, students and historians. 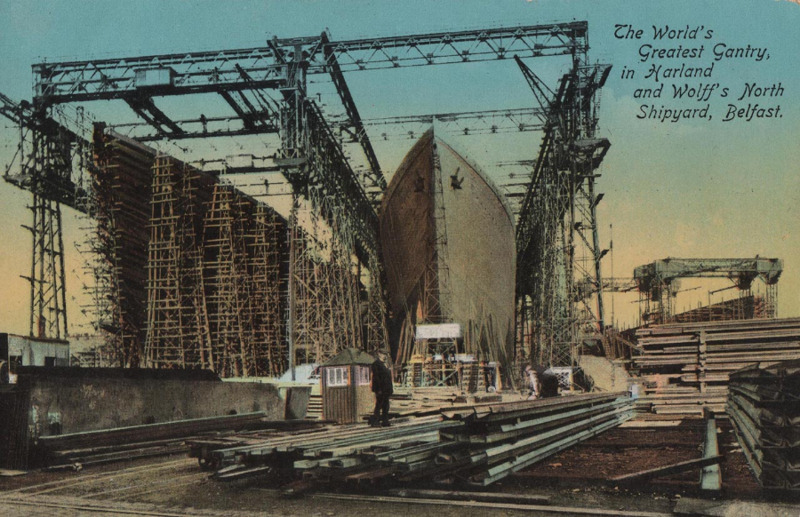 These shipyards drove Ireland's economy in the early twentieth century. 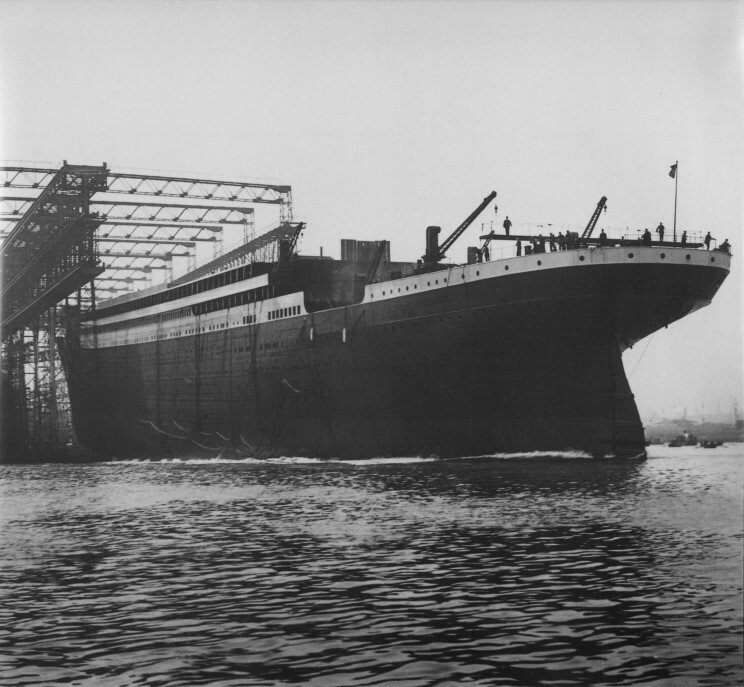 Construction of Titanic began on March 31, 1909 when designer James Andrews laid the first keel plate in the Harland & Wolff Shipyards Belfast, Ireland. Titanic's sister ship The Olympic had begun some three months earlier and the two ships were essentially constructed side by side by over 15,000 workers, Constructing the Titanic would cost 8 employees their life working on such a mammoth and often dangerous construction site. When Titanic was designed, no facilities existed to build or berth such a large ship. Harland & Wolff set about building the two new slipways required, having demolished three smaller ones to make room. They constructed two huge gantries, with moving cranes and lifts, called the Arrol gantries. They also purchased a massive 200 ton floating crane which was used to lift the huge boilers and other mechanical items into place on the ships. 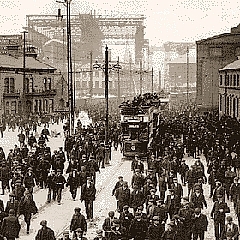 The huge structures of Olympic and Titanic could be seen across most of Belfast City, shrouded by the even larger gantries in which they were constructed. A gantry is a crane system that manoeuvres over the top of a ship in the dockyard carrying materials and workers to the heights and depths of building ships. 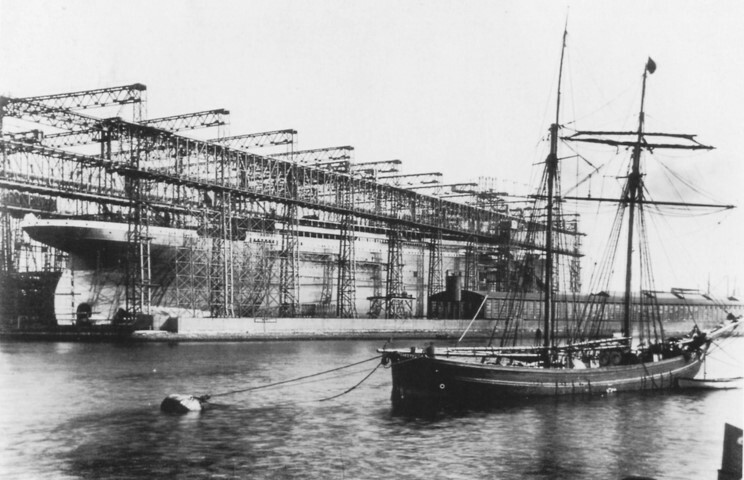 The Titanic's 220 foot Gantries were custom built to meet the needs of such a monstrous vessel and can be seen here. 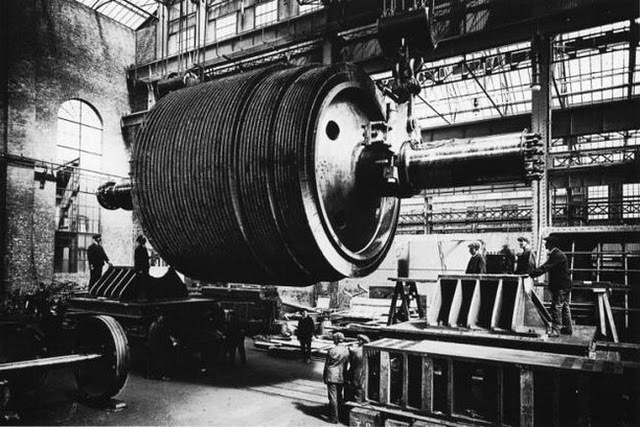 To power the largest movable structure ever made would require an enormous power source and in the early 1900's that source was coal powered steam. There were twenty-four double ended Scotch class boilers and a further five single ended boilers which were housed in six boiler rooms. The double ended boilers measured 20 feet long, with a diameter of 15 feet 9 inches and contained six coal burning furnaces. 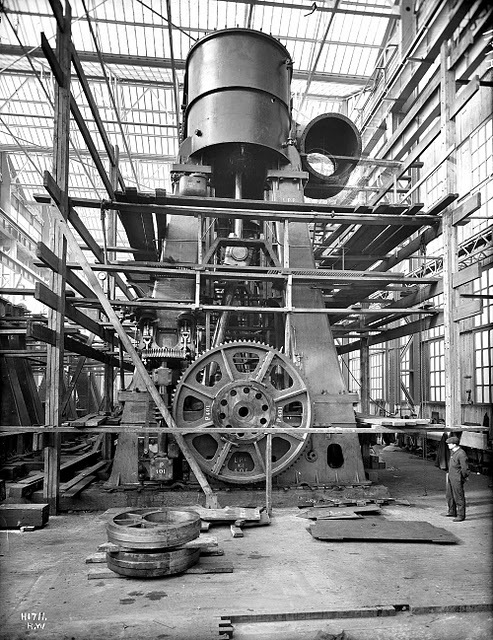 The single ended boilers were 11 feet 9 inches long with the same diameter. With all boilers firing the Titanic produced around 46,000 horsepower. 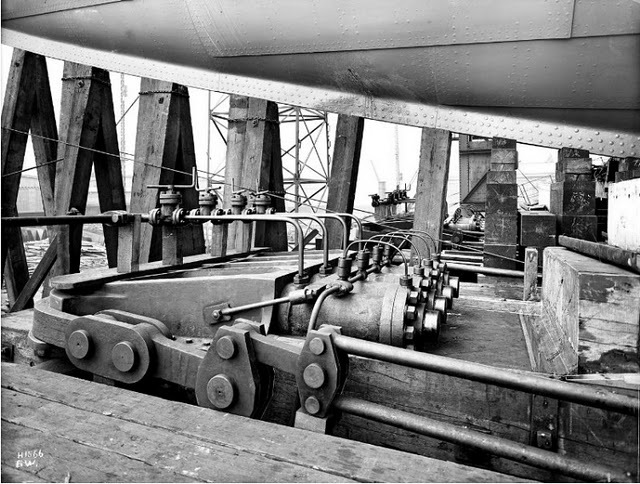 220 - the height of the gantry built over the two ships (RMS Titanic and her slightly smaller sister, Olympic), in feet - fittingly the largest gantry in the world at that time. 3 - the number of years it took to build the RMS Titanic. $7,500,000 - the cost of building the Titanic (£1.5 million). 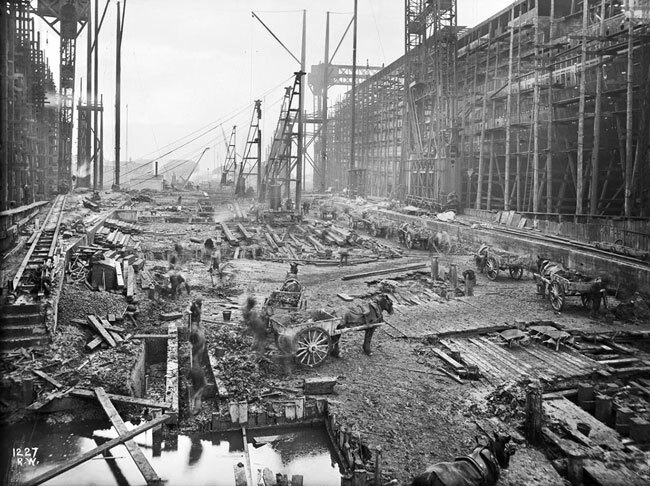 8 - the number of construction workers killed during the build - keel laying to launch (there was an unwritten expectation in shipyards at the time of 'one death for every £100,000 spent, so at a build cost of £1.5, the Titanic's toll was less than the 15 deaths that might have been expected). 3,000,000 - the number of rivets used in the construction of the hull, a mix of iron and steel. 200 - the number of rivets that a 4 man riveting crew could complete per day (assuming dry weather conditions). 15,000 - the number of days work this rate of riveting would have represented for a 4 man crew. 20 - the number of horses needed to transport the main anchor. 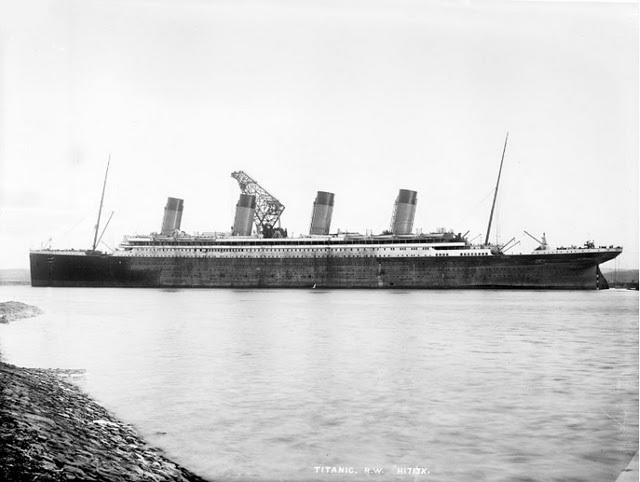 Titanic had three functional funnels: The fourth was purely aesthetic to make the ship look more imposing. Thomas Andrew's original design of the Titanic was so efficient that it was originally conceived with only three funnels to service the massive boilers some 150 feet below. White Star thought it a necessity a ship of such grandeur must possess four funnels. As a result only three of the funnels were functional and the fourth was purely aesthetic. 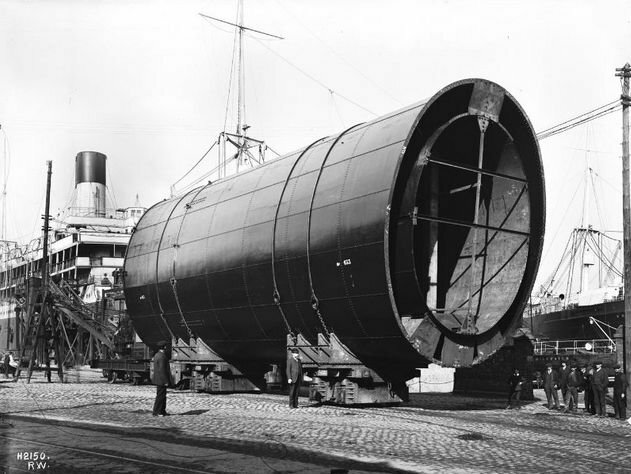 The Funnels were constructed off site and attached after the Titanic had left Dry-dock. 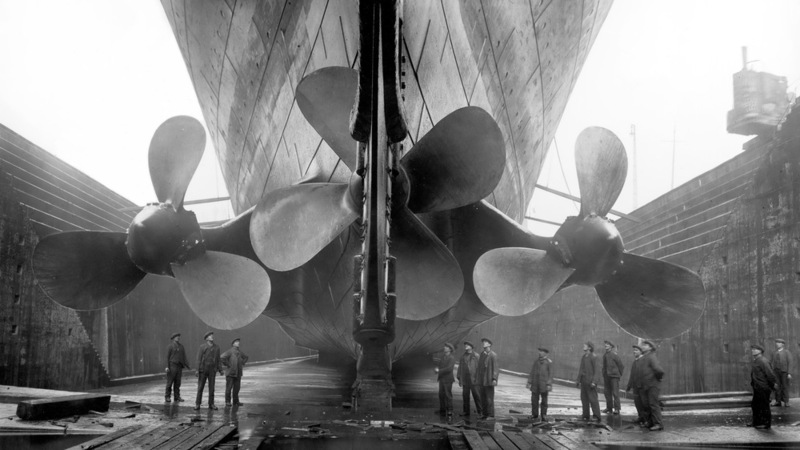 Titanic's triple screw propulsion system were crafted from brass. Note the center screw has four blades whilst the port and starboard have three.. The Titanic was equipped with a steam powered triple screw propulsion system to ensure it moved across the ocean at a respectable pace of approximately 22 knots but the blades were deliberately pitched at such an angle that the ship would not vibrate, discomfort or distract the passengers from the more elegant points of Titanic's voyage on board when enjoying the smoking and dining rooms. As a result the Titanic ran at a slightly slower speed than it could have, but if you wanted sheer speed there were alternatives. If it was pure elegance and dominance of the ocean then the Titanic was the ticket you required. Titanic is primed and prepared for launch. She took 62 seconds to move down the slipway and enter Belfast Harbour. 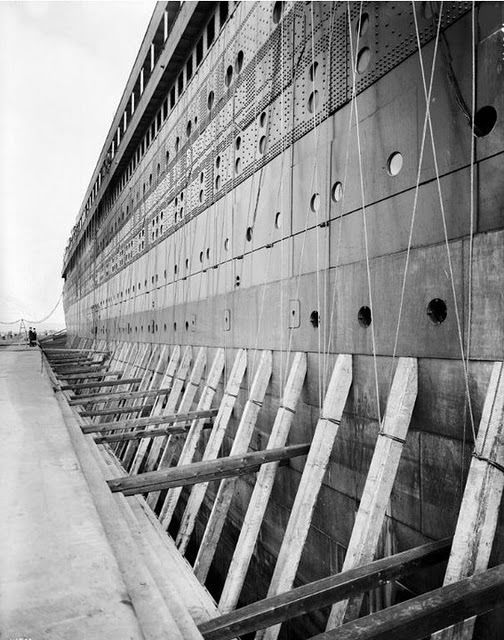 On May 31, the 26,000 Ton hull of the Titanic still smelt of fresh black enamel as it descended down the slipway assisted by 25 tons grease and soap into a fitting basin for internal fitting and completion. Large crowds, press and dignitaries came to witness this auspicious event with some members of the audience doubting that such a mass of steel would actually float. 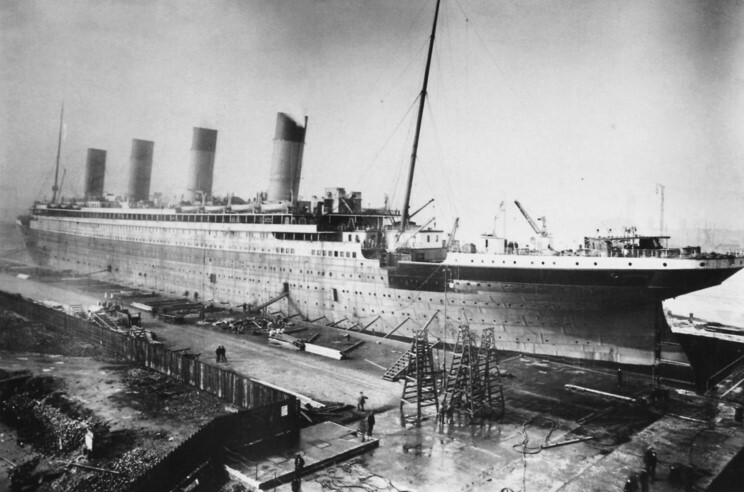 Was Titanic's steel to blame for her demise? Many combining factors led to the magnitude of Titanic's disaster at sea, including lack of lifeboats, flaws in the design of the ship and negligence of the crew. One factor that we can accurately evaluate with today’s technology is the quality of steel that was used for the Titanic, and if any shortcuts were taken during construction that may have contributed to the disastrous event. All three million of Titanic's rivets were driven by hand. According to a study conducted in 1998 and published in 2008 by Dr. Phil Leighly, a professor emeritus of metallurgical engineering at the University of Minnesota Rochester, the steel used for the Titanic did in fact play a role in the sinking of the Titanic. Using a recovered piece of steel from the ship’s hull and bulkhead that was larger than any others previously found, they were able to determine why the steel cracked on the hull. After doing a series of impact tests based on their steel sample, the team was able to determine that the steel used to build the ship was much more inferior to modern steel. 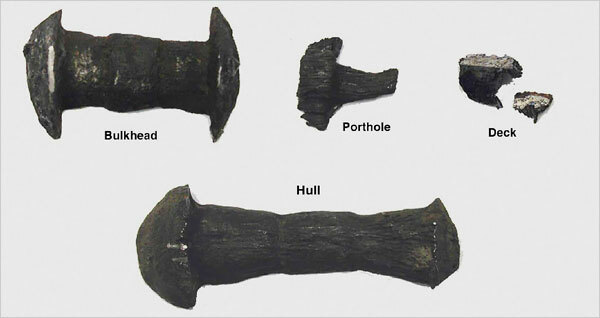 About 10 times more brittle in fact compared to the steel used to make today’s ships. Test results showed high concentrations of sulfur, oxygen, and phosphorous, and low concentrations of manganese, nitrogen and silicon. This was mainly a result of producing the steel using open-health furnaces. Pieces of steel from the hull have also appeared almost shattered, with no evidence of bending or deformation. The frigid waters in which the Titanic struck the iceberg most likely had a big impact on the time it took the Titanic to sink, which was about 2 hours and 40 minutes. The below freezing temperature water made the steel abnormally brittle and less impact resistant and contributed to the size of the hole and the rapid sinking of the ship. Passengers on the Titanic recalled hearing loud cracking noises coming from the ships structure while it was sinking. Leighly noted that you would expect groaning instead of cracking sounds when steel breaks, unless the steel is brittle. Because steel welding was still in its infancy, the colossal steel plate structure of the Titanic needed to be held together by over three million iron and steel rivets, which were hammered into place by hand. 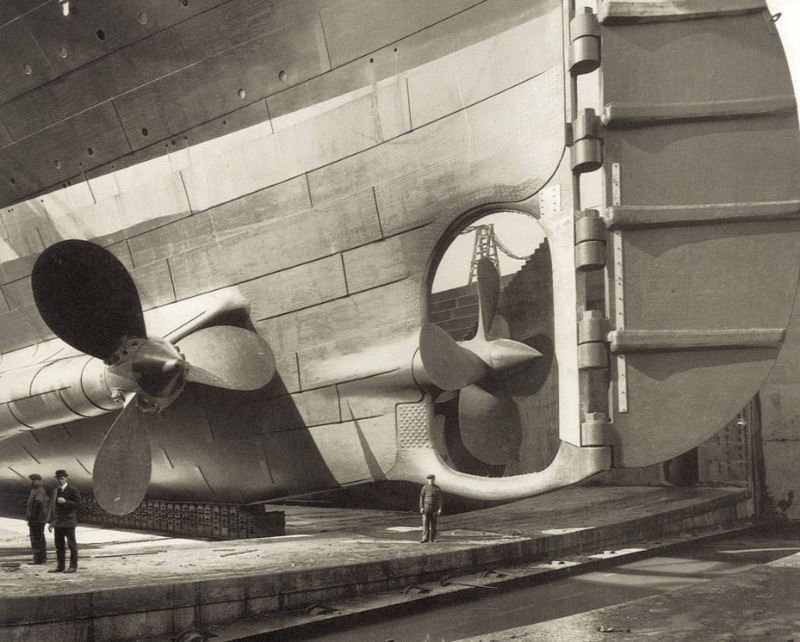 However, there were many additional flaws in the design of the ship that had little to do with the quality of the steel used, including compartments that were meant to be watertight, and lack of welding technology. The steel used for the Titanic was far inferior to the steel typically used today, and was much more brittle and not nearly as impact resistant. However, it was certainly the best steel that could be produced at the time. Leighly concluded that flaws in the design of the ship were a much bigger factor of the sinking of the Titanic than the actual steel used in production. 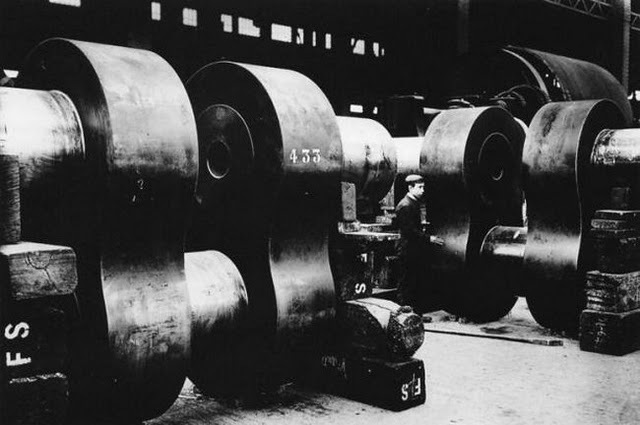 - Thanks to Capital Steel for the information about Titanic's steel.